This a Harris' hawk. I don't know how fast they fly, but they go fast! I got lucky with this one. They are bit unusual in that they hunt in groups. They are indigenous to parts of the southwest, including Texas, Arizona and New Mexico. This was taken in the San Francisco Zoo. I first duplicated the layer, selected her, then elimated the background on that layer. On the original layer, I cloned the backgrond to include the entire photo and applied a motion blur to it to further enhance the blur that was already present. I then selected the bird layer and smudged just the edges so it would look more natural. I cropped and sharpened, and added a border. Excellent pp work and a great shot. A fine capture of this magnificent bird,very well done. Waouh! really nice shot and nice PP. well done. This really looks like the bird was in full flight. Your post processing skills are remarkable. The bird is very sharp, and the green background is a great contrast. My heart immediatly races on viewing this image. Great effect and skillfull processing. what a great job from you again, i reckon I can call you as the master of PS in this site? :D Great movement you've captured and nice DOF. Very nice job. Wow - great work David, you created an excellent image of speed, a true TL photo. Also thanks for your instructive note - Layers one of the things I never realy used in PSP and now I got a fine example how they can be used. Excellent work David. The bird is very sharp, and the green background is a great contrast. I like of this. Super cool shot. The motion is showed nicely and given the green background the bird stands out even more. Wonderful work! GREAT David! I can't explain it in words. Superb picture and your PP is something I can learn from. Thanks for sharing that in your note and for sharing this photo to us. Marvelous effect! Great success with this work! Well done! Wow! Great photo David. You have make a good job with the PP. I like the photo. The result is very good. Well done. Absolutely superb shot David. I love this post processing - you have done incredibly well with it. It also makes the bird look really fast. Colours are very real too. Great work, I must say. Thanks for sharing. this is a wonderful picture it goes right into my favorites and the PS work is great well cropped and captured, the work you put into this great well thoughtout and the you have great skills in PS. 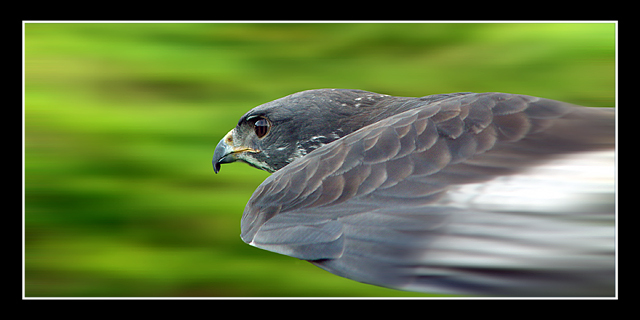 Wow, thats a great shot, the extra motion blur has really drawn the eye to the hawk. I'm not so sure about making the wing extra blurred though. great work. Such a sharp experiment ! Unbelievable!! What a great shot. In addition to all the other stuff, I love the look of concentration on its face. Really nice shot David, a great capture of the hawk. Your photoshop work is very well done too, although I have to admit, I was a little dissappointed to read that this capture was not exactly what it appeared on screen. This is probably just a shortcoming on my part, but I just was hoping this was a "pure" capture. No matter though, the hawk looks great and the photo is super appealing. I like very much the effect of movement. Colours are magnificent and the neatness also. J'aime beaucoup l'effet de mouvement. Les couleurs sont superbes et la nettet� aussi. Well, the result is very nice, the sharp details of the gray bird are perfect on the fresh green background, and the effect of mouvement is very well achieved! Amazing work David. Very Very well done. Both the picture and the Post process. Thanks for sharing both photo and note with pp details. Just amazing! Bravo! You captured this speedy predator just right. I had a "Roadside" hawk of my own once, which resembled this one. At the time I didn't own a camera. But, even if I had, I doubt that I could have shot a better photo than this. Lovely! Wow !!! It�s amazing and perfect shot David ! Very, very well done ! sssscccccchhhttttttt........don't disturbing the flight ! The eye of the photographer is the must. The Image Editor is a complement of a great shot. I missed that one, David! Your smart work, starting from an already very good shot, I guess, is still outstanding, as it adds the essence of what this beautiful hawk means. It's a superlative image, where the subject is much more than what it would look on a photo. In that sense, it reminds me those avertising images where we are astonished by the power of a subject. It's a powerful shot, indeed. Beautiful colors and details. Congratulations! Excellent work David. Full marks for your post-processing skills and for detailing them here for us all to learn. Wow, David, I have never noticed this before. This is one of the best and most meaningful PP works I have seen around here. Thanks a lot for doing and sharing. This is the best picture I've seen in a long time. I've been looking at it for a while and just realised I hadn't given you any points all that time. So there, I rectify the situation. Excellent shot. This somehow reminds me of the post office symbol. Anyway, you have given a great and artistic sense of motion with your extended blur. This a wonderful study in movement and contrasting color. The DOF is excellent. Beautifully done. Let me tell you... Perfect!!! What a shot, what a work you did whit it. My 2 tumbs up for that! I was just so mesmerized looking at this photo, and in my mind wanting how did you get this photo. And then I read your note. So graphically dynamic David. Excellent travail David. Le r�sultat saisissant. Nice work. Amazing rendition of motion. The fact that only the head is entirely sharp, adds more impact to the image and takes the viewer with it. Outstanding! The pp process in amazing. Your work is really admirable, a piece of art. Very well done. heureusement que je suis assise! j'en reviens pas!! fantasmagorique!!! exceptionnelle photo!!!! David, really great work here. I like your post-process. It's not only a beautiful picture, it's a chance for me to learn about dealing with PhotoShop. Beautiful colors, nice BG and excellent sharpness. I some how missed this one David, its a remarkable shot and worthy of 100 points so here are two more. Well done. great clean image here and your tecnique has worked very well to represent the title of this image. Excellent Work ! The speed impression is really there, and at the same time, the details on the hawk's face are so clear ! I saw this for the first time today David. Congratulations, and I'd like to echo the positive comments that you've already received. Wow this is amazing. Talk about a 'birds eye view'. A stunning image. Excellent quality. This is also an essence of your great professionalism. The image is surprising, original, the bottom that you selected contrasts beautifully with the plumage of this hawk. You got a nice background and the hawk is very sharp. Excellent shot. ....wow...that is all i can say. amazing. Je trouve cette photo remarquable! J'ai l'impression d'�tre en communion avec ce rapace et donc de voler � sa vitesse tellement le contraste entre la nettet� de sa t�te et le "flou contr�l�" du reste de l'image est parfait! when I saw it for the first time I thought "very lucky to get this one." Excellent and sharp detail, nicely presented movement! Truly oustanding shot -- brilliant capture and great blur on the wings. You scored big time with this one. Not much more to say, Super work!!! Great PP work and excellent composition. Very sharp image. What else can be said about this work? Truly excellent! Way cool image David. Strong sense of fast motion. Great contrast of the bird against the background. You must be proud of this one. I have no questions - this photo is outstading! Great capture. I thought the bird is flying. Great effect and skillfull processing.The bird is very sharp and the green background is a great contrast. Well done. It's incredible the sense of speed and the detail, superb shot. I like it a lot. i just can say congratulation,i wish i was the one who shot it. it's an awesome shot!Great!the sharpness, composition and colors are superb! Wow, what an exellent shot, it is incredible to see. I wonder what camera you have, it should so special or maybe you are an exellent photographer, yes im sure. Well i like colours and the eagle in movement.What a shot God, What a shot. Im gonna be happy if you maybe want to visit my gallery, nothing special .It is very common. Well see you and regards. A tremendous job you've done--you've managed a holographic appearance with your background and the slight blurring of the feathers. An excellent shot and PP! Well done! I really like the details contrasting with the motion blur. Any details on how you took the pic? Beyond incredible shot David! Excellent pp work on this for sure! The greens are a nice contrast to the bird and make him stand out! A shot that is worth a million! So well done, just what it need to be put in action ! Excellent pp work. Que rajouter aux commentaires ? Je ne trouve pas les mots !!! Exceptional POV, colors and sharpness. wow well captured you can clearly see the speed of the bird. This is absolutely beautiful. Well done. Thank you for sharing! Great capture. Movement is here. Live feeling. This really looks like the bird was in full flight. Amazing picture with very useful note,so that beginners like me can learn something.